A Type Ia supernova explodes (as shown in the dark brown color). 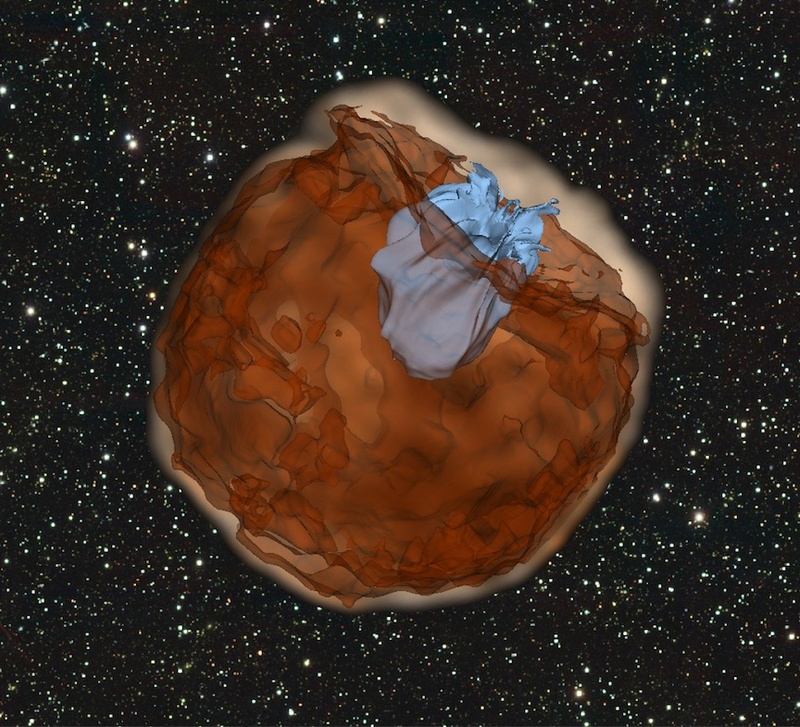 The supernova material is ejected outwards and slams into its companion star (in light blue color). This violent collision produces an ultraviolet pulse which is emitted from the conical hole carved out by the companion star. 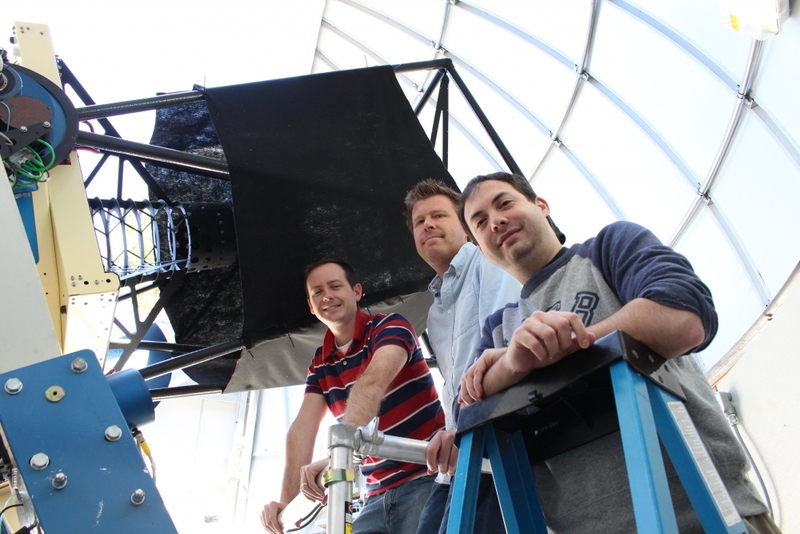 Members of the LCOGT / UCSB supernova team next to an LCOGT 1m telescope. From left to right, postdoc Curtis McCully, faculty member Andrew Howell and postdoc Iair Arcavi. The supernova, named iPTF14atg, is located 300 million lightyears away in the galaxy IC831. The study, appearing in the May 21 issue of Nature, was led by graduate student Yi Cao of Caltech, but included physics postdoctoral fellows Iair Arcavi and Stefano Valenti, and physics faculty member Andrew Howell of UCSB and LCOGT. In a type Ia supernova, a white dwarf star explodes after it gains matter from a companion star in the same binary star system. One of the leading theories is that the supernova happens when two white dwarf stars merge. But a competing theory says that the companion could be a normal or giant star that survives the explosion, although not without some damage. The supernova is expected to hit the companion star, creating a shock wave that glows in ultraviolet light. This had been theorized in 2010, but such an effect had never been seen. This and other factors led many to conclude that most type Ia supernovae arise from the mergers of two white dwarf stars. LCOGT, a global network of robotic telescopes, was influential in obtaining early and regular data, allowing the researchers to determine the type and even the strange subclass of the supernova. Initially, the team was puzzled, said Arcavi. Upon hearing about the supernova, the LCOGT team immediately triggered their worldwide fleet of robotic telescopes. As the Earth rotated, data was collected at different sites, depending on where it was nighttime and the observing conditions were ideal. Ultimately they combined data from LCOGT telescopes located in Texas, Hawaii and South Africa with data from Palomar and NASA’s Swift satellite to piece together the story of the supernova. According to the researchers, the supernova belongs to a subclass of SNe Ia sometimes called SN 2002cx-like. These supernovae may even be partially failed or incomplete explosions. In a normal type Ia the entire white dwarf blows up, but this class may leave a piece behind. There have been conflicting observations about the progenitors of type Ia supernovae. The new study builds on previous work by Howell and some of the study’s coauthors showing that the type Ia SN 2011fe was likely the result of a merger of two white dwarf stars, while the SN Ia PTF11kx seemed to have a red giant companion star. In fact, the study complements work by another postdoc and member of the supernova team at LCOGT and UCSB, Curtis McCully, who was not involved in the present study. He led a team of astronomers who announced in Nature in 2014 that they had found a progenitor on pre-explosion images from the Hubble Space Telescope for a similar SN 2002cx-like supernova, SN 2012Z. In that case, they think what they saw was the companion star, the star that in the case of iPTF14atg shocked the supernova. The iPTF project is a scientific collaboration between Caltech; Los Alamos National Laboratory; the University of Wisconsin-Milwaukee; the Oskar Klein Center in Sweden; the Weizmann Institute of Science in Israel; the TANGO Program of the University System of Taiwan; and the Kavli Institute for the Physics and Mathematics of the Universe in Japan. The Caltech team is funded in part by the National Science Foundation. LCOGT is a global network of 11 one-meter and two-meter telescopes with headquarters in Santa Barbara, California. It has telescopes in Hawaii, Texas, Australia, South Africa and Chile.